This will ensure teams will constantly foul after being behind late. It’s a necessary evil but when a team falls behind in basketball, they look to foul and get aggressive on defense in order to quickly get the ball back without using up much time. It really slows the game down and in addition to timeouts, can take about 15 minutes to play about a minute or two. At some point, when the margin is too much, a team waves the white flag and we’re spared a situation where a team has faint hopes of pulling out a come from behind win. In that rare instance, the constant fouling gameplan actually does work and the University of Texas at San Antonio proved that Saturday night. UTSA was down 17 to Old Dominion with a little over three minutes to play. 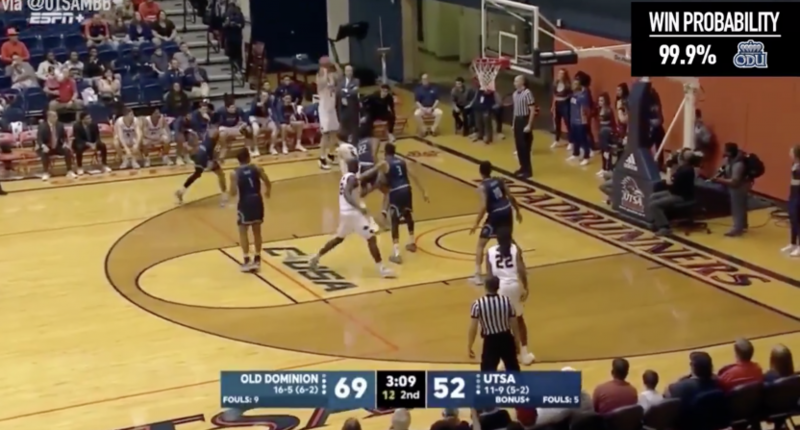 The planets aligned and with a mix of near-perfect three point shooting and poor free throws by Old Dominion, UTSA pulled out the .01 percent chance to overcome the odds and win 74-73, giving teams the belief that they can overcome any deficit, even if it looks like a blowout. Many will look at Old Dominion’s 99.9 percent win probability and snicker but a lot went into overcoming that deficit. From 3:08 to the end, UTSA went 6 for 8 from three and those two misses from three were the only missed field goals in the final three minutes. That kind of efficiency is mind-boggling on any level. On the other end, Old Dominion went 4 for 10 in free throws and 0 for 4 from the field in the final three minutes. When one team is extremely hot and one team is extremely cold, that 17 point margin closes very rapidly. And for that to happen, both teams needed to play their part. So don’t expect a team to overcome a double-digit deficit every day. As long as the team lead can hit free throws, that 99.9 percent chance is still pretty accurate.